When you land on the Island, you will be on Main Street. Go right and Big Nate will talk to you and tell you about a search to find a missing time capsule. 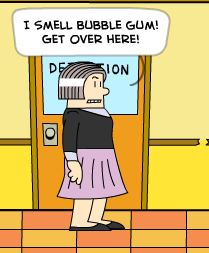 Keep going and enter Klassic Komix. Once inside, go right and talk to a man with a tan shirt on. He will ask you to help him find the rest of a comic he wants to see and he will give you the frame. Exit Klassic Komix, go right, and climb the telephone pole next to Say Cheese. At the top will be a piece of the comic the man was asking about. Collect it. Go back down and enter Say Cheese. Go right and on one of the lights will be another panel of the comic. Collect it, go left, and talk to the man standing in front of the dark room. Talk to him and he will tell you that he would trade his scuba gear for a historical photo. Exit Say Cheese, go left and enter the Pop-In Shoppe. Jump to the highest level of the shop and go left, to the green couch. There will be another panel. Collect it and exit the Pop-In Shoppe. Go right, to the next area and enter the school. Go right, up the stairs, and on a broken PA system speaker will be another panel of the comic. Collect it and enter the science lab to the left. Go left once inside, and on a model of the solar system will be another panel. Collect it. Exit the school and climb the scaffolding to the right. On the top will be another panel for you to collect. Get off of the scaffolding and go to the next area to the right. You will be in the playground. Go right and jump up onto the platform, and onto the next. Keep going up until you get to the top. Go left and there will be a piece of the comic floating in the air above the rock wall. Jump up and collect it (this may take a few tries). Once you’ve gotten it, go right and enter the cabin on the playground. Inside, there will be two minigames for you to play, each with its own reward. You must win both of them. One is just like hangman, and the other is just like table football. When you win table football, you will receive a book of Big Nate’s Practical Jokes. When you win hangman, you will receive a box of peanut butter crackers. Exit the cabin and go to the next area to the right. Go right and climb up to the top of the lighthouse. On the very top will be the last panel of the comic. To the left of the lighthouse will be picture floating through the air. Catch the picture (this may take a few tries) and go back to Main Street. Enter Say Cheese and trade the photo you just caught for scuba gear. Go back to puffin point and talk to the man standing on the pier. He will tell you that he lost his lobster cage in the water. Put on your scuba gear, dive in the water, and find his cage. Once you’ve found it, go back up to the surface and talk to Cap’n Salty. As a reward, he will let you keep the lobster inside of it and give you the keys to his jet ski. Climb up the lighthouse and ask the man painting to use his telescope. Look through the telescope until you find some seals sitting on rocks. In between two of the rocks will be a piece of paper. Exit out of the telescope. 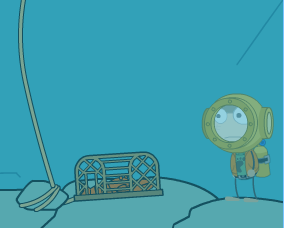 Before going back down the lighthouse, jump up to where the light is and use your lobster to turn the light and shine it on the seagull on top of the school. Go down the lighthouse and click on the jet ski. Before you can go, Big Nate will run in and tell you he’s going to beat you there. 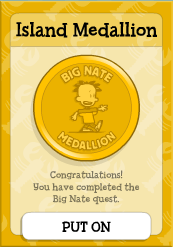 A race will then ensue between you and Big Nate where you will have to dodge obstacles and stay ahead of Nate. Once you win the race, you will be in the area you saw with the rocks and seals. Jump onto the rock that acts like a seesaw and push the rightmost seal to the left with the other seal. The paper will no longer be wedged in the rocks and you will be able to collect it. The roll of paper will be a map to the capsule. Go back to the jet ski and go back to the school. Enter the school and jump up onto the platform. Go left, to the locker that looks overstuffed. Go to your inventory and click examine on the Big Nate Comic. Put it together in the right order. Once it’s completely put together, it will reveal a locker combination on it: 9-3-0-5. Click on the locker and enter that combination. An avalanche of stuff will come pouring out of the locker, sending you very far back and knocking you down. Get up and go back to the locker and click on the stuff at the bottom. You will collect a school blueprint. Exit the school and go back to Main Street. Enter Klassic Komix and give the man his comic. As a reward, he will give you a pack of gum. Go back to the school and enter the science lab. Click on the lab station underneath the poster that says “Think Green.” A beaker and test tubes will come up. Fill half of the beaker with the blue substance, and half of the beaker with green substance. Turn the dial under the beaker to four. You will have made a stink bomb. Exit the science lab, go to the bottom floor of the school, and use the pack of gum. A woman will come out and take you to detention. Once inside the detention room, use the stink bomb. The woman will leave. Go right and click on the green file cabinet. A secret passage to an underground room will appear. Go down to the room. Click on the power switch to turn the power on. Go right, and hanging from the ceiling will be a bell clapper. Collect the bell clapper and go back to the detention room. Exit the room and exit the school. Climb up the scaffolding and onto the top of the school. Climb up to the bell and use the bell clapper. The bell will ring and the girls chatting on the playground will come in from recess. Go to the playground and use the peanut butter crackers. Spitsy the dog will dig where the girls were. You will have to pull out the rest of the time capsule. Inside of it will be a very valuable giant pearl. A newspaper will pop up, showing Nate and Spitsy with the pearl. Close out of the paper, and the woman who put you in detention earlier will give you the island medallion.